After 26 and a half years of serving Resurrection Lutheran Church and School, and over 40 years in the pastoral ministry, Hank and Rita Hollar were celebrated, toasted and honored by their church, family members and friends. Over two hundred people packed the Fellowship Hall and Youth Room Saturday evening to enjoy a BBQ meal and reminisce, laugh, shed a tear and pray a blessing on this beloved couple. After dinner, everyone filled the church sanctuary for the tributes and program. Friends and family came from Ohio, Pennsylvania, North Carolina, and all over Virginia to speak from the heart, share laughter and memories. SED President Denninger gave a videotaped talk thanking both Pastor Hank and Rita for their faithful years of service. Pastor’s servant heart, unconditional love, serving in various roles in the SED, challenging sermons, personal outreach to the sick, those facing surgery, and the bereaved, his use of highlighters and different fonts, his musical, humming style and his beloved Alabama football team were celebrated. Also noted was Rita’s love for all children, unswaying support for her husband and her church family, easy going sense of humor and her work in the LWML-WIGS group. Special speakers included Bill Deck, Gary Funaiock, John Gerke, and Esther Loch. Jason Hollar gave an emotional tribute to his dad. Other church members, neighbors and family members stepped up to the lectern share their blessings and memories. Ann Ezell closed the program with laughter and joy. 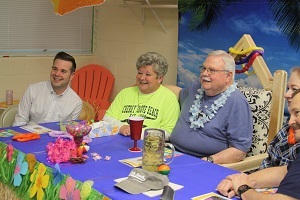 Gifts were given: A special crystal award and monetary bonus from the congregation, fancy beach chairs from the BoD, a colorful beach umbrella from RLS, and WIGS presented Rita with a lovely decorative addition to her Christmas snowman collection.